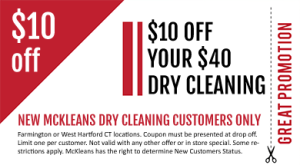 For NEW McKleans Customers only: take $10 off your $40 or more dry cleaning order. Coupon must be presented at drop off. Limit one per customer. Not valid with any other offer or in store special. Some restrictions apply. McKleans has the right to determine New Customer status.